Pink eye is also called conjunctivitis. Under these conditions, the material that covers the white of the eye and lines the inside of the eyelid (known as the conjunctiva) becomes irritated and inflamed. This inflammation results in excessive tearing, pain and itching. The contagious forms of pink eye are usually due to bacterial or viral infections. Non-contagious pink eye can occur when eye irritants such as allergens, dust and smoke are in the environment. Viral conjunctivitis usually affects only one eye, which has over-watering and a light discharge. Crusts on the eyelids sometimes occur. Bacterial conjunctivitis often spreads to both eyes and causes a discharge, sometimes greenish. Crusting may appear on the eyelids. Allergic conjunctivitis causes itching, redness and excessive tearing in both eyes. Your nose may be stuffy, and you may have itchy and runny nose. Viral and bacterial conjunctivitis are highly contagious and, as they most often occur in children, it becomes difficult to keep children from infecting both eyes. 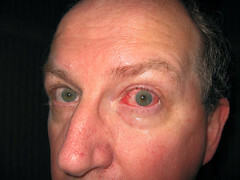 Generally, the infection will start in one eye, then often spreads to the other eye. First, call your doctor. You’ll need to go to see him so they can properly diagnose pink eye. Always take the medicine they give you for the time specified. You can also make a solution of turmeric, which is the best home remedy for pink eye with 2 c. tsp turmeric powder to a cup of boiled water and also use hot compresses. Wash your eyes with a mixture of one pint of salt in boiled water and cooled to room temperature. Wash your eyes with this solution 4-5 times per day. Hot compresses help pink eye. The bugs that cause it are very sensitive to heat. The heat increases blood circulation and removes debris. Vitamin A is essential to fight against eye disorders. It protects against infection – especially the mucous membranes lining the eye. In rare cases, vitamin A deficiency actually causes the pink eye. No problem. Eating a carrot and get your daily intake and then some. Other foods rich in vitamin A include cheese, cheddar cheese, potatoes, whole milk, liver, spinach and corn. Use antibiotics to get rid of bacterial conjunctivitis. Antibiotics are the best, easiest way to get rid of pink eye. Even if your pink eye was caused by something other than bacteria, your doctor may prescribe antibiotics if there is a secondary infection. Usually, antibiotic eye drops are used to treat conjunctivitis. Wash your hands before and after, and if you use a dropper, do not let it touch your eyes or you might need to get a new one. Use a tea bag compress. This remedy has been around for many years. Some teas contain elements that can ease and even get rid of pink eye symptoms – especially the swelling and irritation. Calendula, chamomile, fennel, black and green tea have all been used to good effect. Reheat the tea bag(s) in place (in cold water for allergic conjunctivitis), then place them on the eye for 10-20 minutes. There are artificial tears available on the market. These drops can soothe the eye and help flush out toxins and irritants. The homeopathic remedy Calcarea carbonicum, used once daily for three days, may help clarify some cases, particularly in infants who suffer from other symptoms like constipation and heavy sweating. On the other hand, if you have severe symptoms that arise from nowhere, as a remedy Belladonna might be more appropriate. Temporarily get rid of the symptoms of conjunctivitis with eye drops and OTC analgesics. Do not use eye drops to deal with pink eye vasoconstrictors. These products do not get out the red but also delay healing and in rare cases, damage the eyes. Look for products containing saline and fresh as alternative relief Similasan Pink Eye (especially good for viral pink eye ), which is found in any drugstore. Use acetaminophen (Tylenol, Excedrin) or NSAIDs (aspirin, Aleve) may help reduce swelling and irritation. Take zinc. Zinc not only helps your body absorb vitamin A, it supports and facilitates a healthy immune system. There is evidence that suggests that zinc has antiviral properties, making it an ideal mineral to get rid of viral pink eye. It is best to get zinc in foods (fish, meat, lima beans, seafood, legumes, pecans, egg yolks …), but if you use a supplement, try zinc lozenges, the body can more easily absorb the mineral in this form. Soothing pink eyes with a hot compress or cold. Soak clean, lint-free tissue in hot water (cold water for allergic conjunctivitis), dry them and put them on your closed eyelids for 10-20 minutes. This can occur several times a day to calm down and get rid of the symptoms of conjunctivitis. Then, the paintings must be discarded immediately or washing to prevent spreading contagious pink eye. In addition, if one eye is infected, not a cloth cover on both eyes or you will certainly extend to the healthy. Some people suggest applying cold bread with your eyes closed, this can reduce inflammation and soothe itching. Some eye baths include a mixture of eyebright or goldenseal, three times a day, eye drops containing a teaspoon of baking soda in a cup of water or a tablespoon of boric acid in one liter of water ( be sure to use sterile water), and hot or warm milk. Since tea contains bioflavonoids that can help ward off infection and reduce inflammation, many people use wet or partially used teabags as a home remedy for pink eye by placing the tea bag over their eyes . Eyebright tea, green tea, black tea or can be used for this purpose. Repeat this treatment several times a day. Tea contains tannic acid, such as green and black teas are also particularly good for calming bothersome itching that usually comes with pink eyes. Put a thin layer of babywash in the eye at the first sign of conjunctivitis can help address them, and if it becomes more and more necessary, he completes the cure within days. It stings a little but not very uncomfortable. Boil fennel seeds and use them to wash the affected eye. They reduce inflammation, redness and pain in eyes. You can also make a tea using powdered root bark of barberry in a cup of water. Boil the solution for about half an hour, then use it as a compress or eye. Barberry contains berberine, which is an antibacterial compound. Patients with pink eye should avoid excessive intake of starchy and sugary foods that might be in the form of white bread, potatoes, desserts, pies, sugar, jams and cakes, etc. Other dietary considerations. Eat plenty of green vegetables and many fruits. Vitamins C and E are particularly important for healing and immunity. Many of these essential vitamins and nutrients work together synergistically, they reinforce the effect of absorption in another. Take a daily multivitamin is fine if your diet is a work in progress, but to transport goods through food is the best. Give your body the tools it needs to be rid of pink eye as quickly as possible. A simple home remedy for pink eye is a drop of castor oil in the eyes three times a day. One of the easiest home remedies for pink eye is Aloe. You should soak a cloth with aloe vera juice and then place it on the affected eye. It can also be used as eye drops. A home remedies for the largest pink eye is to put a drop or two of honey directly on your eyes or you can also put 3 c. tablespoon honey 2 cups boiling water, stir to dissolve, cool and become then use as eye twice a day. The honey has antibacterial properties and it will also relieve the eye promote healing. A drop of castor oil in the eyes three times daily is also said to be a home remedy for pink eye. You can use elderflower tea to wash the eyes with conjunctivitis. This is one of the best natural remedy for pink eyes. You can add 1 tablespoon teaspoon dried chamomile flowers to 1 cup of boiled water. Steep for about ten minutes and then pass. Allow him to become cool and use as eye. It can also be transformed into a compress. This is one of the best use of pink eye. Mix 1 c. teaspoon baking soda in 2 cups of water. This makes eye soothing. This is one of the pink eye cure effective. Marigold is known for its unique antiseptic and anti-inflammatory. Marigold helps compress the pink eye. Many people suggest using hot (warm) milk or eye compress. Many folk treatment for pink eye suggest applying a poultice made from live culture yogurt every day. This helps reduce inflammation. Keep your eyes clean. You do not want to leave the drainage of the eye and pink crusts sit and fester. If you do, you ask an infection or other deeper. To get rid of the filth of pink eyes, use a clean cloth or tissue, without dyes or perfumes (wet for comfort). From inside the eye, nose and wipe outwards. Find a clean place on your fabric for each run. Wash your hands and discard or wash cloths immediately when you are done to avoid spreading the pink eye. Grate raw potatoes and place the slice on the affected eye. Potato is an astringent and therefore helps to reduce inflammation. The potato can be transformed into a poultice and can be placed on the eye reached twenty minutes. To do this, for a minimum of three consecutive nights get better results. This is one of the natural effective remedy for pink eyes. Get rid of pink eye caused by allergies using antihistamines and NSAIDs. Allergies can turn you into a snot factory sneezy, but they can also irritate the membranes around your eyes and irritate the eyes pink. When this occurs, antihistamines and the use of NSAIDs (non-steroidal anti-inflammatory). There are many OTC options, but if they fail to produce results you need to get a stronger prescription allergy. I suffer from allergies during the harvest in the North. I refill my prescription and basically stay within agriculture cursing. Fill a sock with rice. Tie a knot in the top. Heat the rice-filled socks in the microwave for approx. 1 minute. Hold the sock to the eye until it cools completely. The heat will feel well and could make your eyes water, which is a good thing. Then, wash your eye with a warm, chamomile tea bag wet (which is best, but any kind will do). To do this, whenever your eyes feel irritated. Colloidal Silver is a great remedy for pink eyes. Breast milk is the best home remedy for pink eyes. Remember to use only fresh milk in the cure pink eye. Just a drop or two on a warm washcloth and place on the eye for 5-10 min. then repeat this cycle again 3 treatments. If milk works its probably because it contains hydrogen peroxide, so the natures of the fight against bacteria. Avoid harsh chemicals and other irritants. Some cases of conjunctivitis are caused by foreign objects in the eye or chemical splashes. There is not much, but you can rinse the eye, use saline drops eye, the doctor’s visit, and wait. Chronicle of pink eye can occur when you are exposed to chemical irritants and on a daily basis. You may need to stop smoking or using certain cosmetics. Perhaps as detergents and other cleaning products at home were originally pink eye. Another home remedy for pink eye is using eye boric acid to a solution of one liter of boiled water and 1 c. tablespoon of boric acid, enabling them to become cool and use a washcloth or three times a day piece of gauze. Do it and let it dry, then rinse thoroughly. If your pink eye was caused by a viral infection, it is highly contagious. We must take great care not to spread this to other people. Whether you think you have this type of conjunctivitis or not is always a good idea that you get to see your eye care professional as soon as possible. There is a remedy for pink eyes and the sooner you treat your pink eyes, the quicker it will disappear. Be sure and wash your hands often to prevent reinfection or infecting others. Conjunctivitis is highly contagious, proper precautions must be taken once affected. low immunity may precipitate recurrent episodes of illness. safe drugs natural combination of homeopathic remedies energized, vitamins and sarcodes. Biogetica offers treatment protocols based upon these principles. They help to fight against the body and causing conjunctivitis immunity against it to prevent future episodes. They provide immediate relief of acute pain due to swelling. Customers report faster and more lasting relief of their products. This entry was posted in Featured, Health and tagged conjunctivitis, get rid of pink eye, home remedies for pink eye by JK-Health. Bookmark the permalink. Ok, what if one of your eyes is red and it hurts but no crusting happens or anything else and I’ve put eye drops in it. Black tea really works, just placing it outside your eye when warm for ten minutes! ← Previous Previous post: Cheap Men’s Sweatshirts – Nobody Can Afford To Miss Out On Them!